VIATORIS is the flagship of Conrad Shipyard based in Gdansk, Poland.Her exterior design is by Reymond Langton & naval architecture by Diana Yacht Design - the same team behind the 2013 40m Hakvoort APOSTROPHE.Full displacement steel hull, aluminum superstructure, built according to and under survey of Lloyd's Register and in compliance with MCA LY3 for vessels of less than 500GT. United Yacht Sales New Jersey would love to guide you through a personal showing of this 131' Conrad 2018. 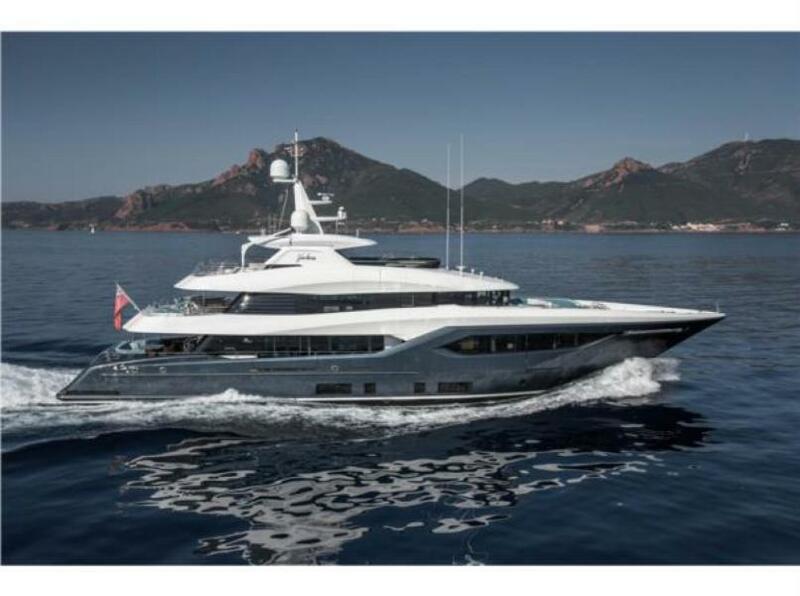 This yacht for sale is located in Croatia and priced at $21,160,656. For a showing please contact us by filling out the form on this page and we will get back to you shortly! VIATORIS which was launched in Spring 2018 and is the flagship of Conrad Shipyard based in Gdansk, Poland.Her exterior design is by Reymond Langton & naval architecture by Diana Yacht Design - the same team behind the 2013 40m Hakvoort APOSTROPHE.The brief behind VIATORIS by her experienced owner was to create an elegant yet comfortable interior and extremelylivableexterior spaces and I feel that was accomplished.VIATORIS is a full displacement steel hull, aluminum superstructure yacht built according to and under survey of Lloyd's Register and in compliance with MCA LY3 for vessels of less than 500GT. 1.3. CLASS, REGULATIONS, SURVEYC133/VIATORIS including her construction, machinery and essential equipment was built accordingto and under survey of LLOYD’S REGISTER with class notation 100A1 SSC Yacht Mono G6, LMC and in compliance with MCA LY3 for vessels of less than 500GT.1.4. 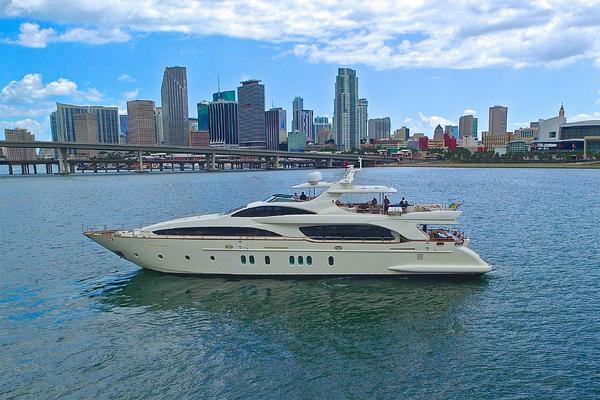 COMPLEMENTThe Yacht was designed and outfitted to accommodate the following complement:Cabin	Area	No. of berths	CapacityOwner	Main deck	1 x double berth	2Guest 1	Cabin deck	1 x double berth	2Guest 2	Cabin deck	1 x double berth	2Guest 3	Cabin deck	1 x double berth	2Guest 4	Cabin deck	1 x double berth	2Crew 1	Cabin deck	2 x single berth	2Crew 2	Cabin deck	2 x single berth	2Captain Bridge deck	2 x single berth	2Total Owner and guest	10Total crew	6Total complement	162.1. GENERAL REMARKSSteel and aluminium alloy used for construction of CONRAD 133 are of the highest quality materials from EU located mills, always provided with quality certificates. Hull and superstructure construction built by qualified workers and under supervision of LLOYD’S REGISTER. Hull and superstructure construction sandblasted from outside and inside in areas where the paint will be applied. INTERNATIONAL/AWLGRIP paint system applied according to instructions of paint manufacturer.2.2. HULL LINESThe hull is full displacement round bilge hull, with integrated swim platform, straight keel and bulbous bow, optimized for best performance.2.3. HULL & WEATHER DECK CONSTRUCTIONHull and weather deck welded throughout steel construction. Unless specified otherwise, grade A shipbuilding steel used in hull construction and designated areas of superstructure. Reference shall be made to relevant regulations of Classification Society for manufacturing and testing of the steel. Plates and sections sandblasted and protected with the primer. Prefabricated steel sections sandblasted to SA2.5. Engine room situated under salon separated with watertight bulkheads. Hull equipped with integral fuel, fresh water, sewage and oil tanks as per contract GA plan and associated drawings. Tank interior construction executed in such a way that any liquids will run freely to the deepest point. Tanks equipped with manholes and proper connections. The hull divided into watertight compartments according to governing regulations. Two units of sliding watertight doors fitted on cabin deck between the subdivision compartments of the yacht, according to governing regulations. Sliding doors are elegantly concealed in surrounding decorative interior furniture.2.4. FIXED BALLASTBuilder will be allowed to install lead ballast to trim the vessel. Such ballast will be properly installed in the hull at location agreed upon with Naval Architect.2.5. SUPERSTRUCTURESuperstructure construction above the steel deck fabricated of 5083 H111 aluminium alloy and applicable extruded profiles of 6082 T6 aluminium alloy. Connection with steel hull structure with use of bimetallic explosion bond strip, TRICLAD or equivalent.3. MAIN ENGINES & PROPULSIONC133/VIATORIS is powered by two diesel main engines CATERPILLAR C18 ACERT B-rated 500kW@2100 rpm, equipped with ZF W650 gearboxes, working in twin propeller installation. Two oil and water lubricated propeller shaft installations, make RUBBER DESIGN, with 5-blade 1300mm fixed pitch type propellers, make VAN VOORDEN.4.1. RUDDER MACHINEJASTRAM hydraulic steering system, 35 degrees rudder angle in both directions; one independent hydraulic power unit located in aft tech space; one steering pump for manual servo hydraulic and one for manual emergency steering.4.2. THRUSTERSThe vessel has been equipped with bow and stern tunnel thrusters, make VERHAAR OMEGA. Each thruster provided with 4-blade propellers and rated at 55kW, operated by squirrel cage electric motor 400V/3ph/50Hz. Such arrangement provides very good manoeuvrability even under less favourable weather conditions. Thrusters controls installed in the wheelhouse and on both wing stations.5. AIR-CONDITIONING, HEATING & VENTILATIONAll living accommodations are air-conditioned, supplied from the central WEBASTO chiller of capacity of 448.000 BTU installed in the engine room. System includes mechanical ventilation system with fresh air make-up where fresh air is pre-cooled or pre-heated before supply to accommodations. Heating function performed by AC fan coil units that supplied with hot water from in-line electric heaters.Air-conditioning was designed to meet following design conditions:Summer outside air:	35·C	orSummer inside air:	22·C	andWinter outside air:	0·C	Winter inside air:	22·C	andSummer sea water temperature:	32·C	Winter sea water temperature:	0·C	6.1 FRESH WATER SYSTEMPressurized fresh water system, two water pressure pumps and circulation pumps, supplying cold and hot water to all fresh water consumers. Cold fresh water supplied to water heaters, toilets and bidets flushing, fuel separator (by means of faucet in ER), windscreen wipers, watermakers flushing system, deck washing and domestic equipment. Access for routine maintenance provided to all main components of the system. Two electrical water heaters, each of capacity of 200 litres, provide hot water supply. Two SEA RECOVERY AQUAMATIC 1400-2 watermakers installed, each of capacity of 1.400 gallons (5.300 liters) per day. Fresh water produced by watermakers transferred directly to one of two integrated fresh water tanks. Watermakers supplied from dedicated raw water intake. Fresh water installations: GEORG FISCHER system.6.2 RAW WATER INSTALLATIONRaw water installation fed from two central intakes located in the engine room, equipped with sea valves and strainers, connected by means of manifold. Main raw water consumers are: main engines, generators, air-conditioning system, sewage treatment system, and ER heat exchangers. Raw water pipelines made of galvanised steel or CuNiFe depending on salinity, fittings made of stainless steel, steel or cast iron.6.3 SEWAGE SYSTEMSewage system consists of three integrated sewage tanks and one sludge tank. All sewage is discharged to sewage tanks, from which it is transferred to sewage treatment plant make: HAMANN HL-Cont PLUS 02 Slim. Grey water from galley sinks led via local grease separators. Electric toilets in each bathroom. Sewage installations made of PVC-U, make GEORG FISCHER or equal.6.4 BILGE & FIRE FIGHTING SYSTEMBilge and firefighting system, serving all watertight compartments of the vessel, with capacity meeting Class Regulations, installed in accordance with good shipbuilding practice. System operated by three pumps: electric bilge pump, electric firefighting pump, and Diesel emergency pump. Main bilge pump and pump servicing main firefighting line interchangeable through the use of valves. Anchors flushing carried by use of firefighting line. Chain lockers drained directly overboard. Bilge and firefighting pipelines built of galvanised and stainless steel.6.5 COMPRESSED AIR SYSTEMCentral compressed air system with a service pressure of 8 bar supplies vessel horn and transom gate inflatable gasket. Additionally, there are provided connections of pneumatic tools in the engine room, garage and forepeak. System supplied from compressor installed in aft tech space, make: GIANNESCHI. Optional independent diving air compressor installed in aft peak, make: BAUER JUNIOR-II.6.6 FUEL SYSTEMFuel system, supplying main engines and generators, arranged and installed in accordance with good marine practice and Class Regulations. In general, there are seven integrated fuel tanks and one day tank installed; fuel transfer shall be by means of fuel transport pump (or emergency hand pump), through fuel manifold. Fuel will be serviced by ALFA LAVAL fuel separator and transported to day tank, from which it will be transferred by local fuel pumps to Diesel consumers. System shall be equipped with remote cut-off valves installed on day tank. Two bunker stations, one on each side. System pipelines made of steel.6.7 LUBRICATING OIL SYSTEMPressurized oil fill and discharge system. Lubricating oil consumers onboard are main engines, gearboxes and generator - all consumers use the same type of lubricating oil. Lubricating oil distributed by means of electric transport pump (or emergency hand pump) to oil line with quick release connection. Used lubricating oil will be transferred through quick release connections from consumers and transported to waste oil tank by means of oil pump. Using valves, waste oil pump shall operate also as waste oil tank discharge pump.6.8 EXHAUST SYSTEMTwo dry/wet exhaust lines for main engines including dry silencers, by-pass above waterline and water mixers, make TIO BV. Dry silencers installed on a dedicated frame connected to the engine room bottom structure. Two dry/wet exhaust lines for generators, including dry silencers, water mixers and separators, make HALYARD.6.9 HYDRAULIC SYSTEMOne dedicated hydraulic unit, make FEEBE, installed in aft tech space to supply following hydraulic consumers:- gangway- transom gate- folding bulwarks- folding balconies- steering gear, make JASTRAM, equipped with independent hydraulic power pack powered by 400 VAC driven hydraulic pump and manual hydraulic steering in aft peak for emergency manoeuvring- deck crane, make BESENZONI, equipped with independent power pack7.1 MAIN DECKBetween port and starboard stairs to the bathing platform, integrated bench seat with a fixed dining table are built as an integral part of the hull in main deck stern area. One sink on port side, under mounted into counter top. Access to main deck saloon through sliding door installed aft, make: OPACMARE 2T11 or equal. Custom built glazed stainless manual doors in saloon on both sides installed to reveal the descending bulwarks. Owner’s stateroom features custom built manual stainless doors with adjoining folding parts of bulwark on both sides forming small side balconies.7.2 BRIDGE DECKOn aft bridge deck under the roof and against bulwark on PS there is L-shaped service bar built in aluminium with composite countertop and barstools. Integrated seating built as an integral part of the superstructure in bridge deck aft area on SB. Access to bridge deck skylounge through sliding door installed aft, make: OPACMARE 2135.05. Integrated bench seat with fixed tables constructed in front of wheelhouse as an integral part of superstructure. Raised sunbathing pads in port and starboard forward of the wheelhouse, with a walkway in between leading to bow area. Hydraulic tender crane, make: BESENZONI G.711, installed in bow area.7.3 SUN DECKAntenna mast construction with an arch installed on sun deck serving as antenna support structure, with integrated provisions for vent pipes, cable ducts, inspection hatches, etc. Underneath the arch separated glass-enclosed areas with fitness centre equipped with training wall and running mill on port side and glass-walled cozy sauna, custom built on starboard side. In front of the arch C-shaped integrated sofas with fixed coffee tables constructed on both sides. Forward of the sofas steps leading to built-in hydrospa, make: TEUCO.8. INTERIORCustom designed and custom made interiors of highest quality, configured to accommodate 10guests in 5 cabins, comprising Owner’s cabin and 4 double guest cabins. Classic warm interiors are finished with various kinds and colours of wood including Rosewood, Makassar ebony, Mahogany and Oak. Sumptuously furnished lower deck provides four double guest cabins offering multiple layout options – separate double bed cabins, twin cabins or VIP cabins with suite. Main deck embraces luxurious open plan saloon comprising dining area and comfortable relax zone, where glazed doors and folding bulwarks on both sides create space nicely open to ocean breeze. Comprehensive galley and pantry are richly equipped with GAGGENAU household appliances. Automatic dumbwaiter connecting pantry and skylounge completes practical comforts of this high- end interior. Finished with Oak and Rosewood Owner’s area in bow part includes small office, walk- in wardrobe, spacious bathroom with separate entrance for him and her, as well as nicely sized full beam cabin with stainless glazed doors and folding balconies on each side. Kept in darker colours scheme and richly finished with Rosewood, Mahogany and stained Oak, situated on bridge deck skylounge offers truly welcoming ambience and entertainment facilities. Aft sliding door opens wide creating one space with outside deck.Bow part of lower deck contains entirely independent crew quarters – two double cabins and crewmess, while the captain’s cabin has been located on bridge deck, adjacent to the wheelhouse connected with crew area by means of separate crew lobby.9. ELECTRIC SYSTEMElectric system is three-phase 230V/400V 50Hz system supplied from two 400VAC 50Hz CATERPILLAR C4.4 99kW generators with automatic parallel system and 90kVA shore power converter, make ASEA. Electrical consumers are based on 230/400VAC power supply from generators and shore power, 24VDC from battery banks, and 12VDC for individual consumers by means of dedicated transformers. Whole electrical equipment, wiring and complete installation is in accordance with good marine practice and governing regulations.10.1 NAVIGATION & COMMUNICATIONComplete package of navigation and communication electronics based on FURUNO and SIMRAD equipment, meeting requirements of IMO, Flag and MCA LY3 for navigation Area 3, has beeninstalled on the bridge, captain’s cabin and in crew mess. INTELLIAN TV and VSAT dome antennas installed on the mast.10.2 ENTERTAINMENTCONRAD 133 will be equipped with entertainment electronics in accordance with interior and exterior GA. Entertainment system will be based on Owner’s preferences according to AddendumA Allowances.11.1 ANCHORING EQUIPMENTTwo high holding type stainless MANSON anchors, each with a weight of 300kg and two galvanized stud link 17,5mm anchor chains, operated by electric windlasses installed in bow area, make MAXWELL VWC8000. Anchors stored in stainless steel anchor pockets on both sides.11.2 MOORING EQUIPMENTVessel equipped with custom built stainless steel tubular bollards and stainless fairleads. Two electric mooring capstans aft, make MAXWELL VC6000, installed aft. Ropes on the bow operated with mooring capstans installed on windlasses.11.3 WINDOWSVessel equipped with highest quality glazing delivered and installed by TILSE, including nicely shaped windshield supporting stainless handrail on sun deck. Glass thickness calculated according to requirements of the Class. All windows of non-opening type, glued to frames according to Builder standards, approved by the Class.11.4 RAILINGS & BULWARKSClosed sections of bulwark around the deck shall be welded watertight. On top of the bulwark sockets for hand railings should be welded. Stainless steel railings made of elliptical and round pipes, equipped with PMMA or tempered glass panels on bridge deck aft and sun deck. Salon area bulwarks on both sides and Owner cabin on both sides to be equipped with folding bulwark parts.11.5 TEAK DECKMain deck, bridge deck and sun deck covered with 15mm teak planks, 12mm planks installed bathing platform and balconies. 20mm teak planks installed in bow part. Teak planks glued and sealed with SIKAFLEX system.11.6 STERN AREACustom FEEBE electric gantry crane with SWL of 1400kg installed in the garage for operation of thetender (1000kg, Owner’s delivery). One fully retractable hydraulic FEEBE gangway. Stern area equipped with a hydraulically operated garage door forming swimming platform when opened.11.7 WINDSCREEN WIPERSFront windows in the wheelhouse equipped with five electric wipers with spray nozzles, controlled from the wheelhouse. Male: EXALTO.12. INSULATIONInsulation system as required to meet noise, vibration and thermal requirements according to good marine practice, Class and the Contract Specifications. Anti-drumming system in garage and engine room, thermal and acoustic insulation throughout the yacht. Structural fire protection provided in accordance with Classification Society and Flag Administration requirements. Fire- insulating properties govern the choice of material where more than one type of insulation is required,.12.1 SIDES AND ACCOMMODATIONSThermal insulation provided throughout the hull and superstructure, in all living spaces, service spaces and working spaces, etc. Thermal insulation of hull, weather deck and superstructure based on mineral wool panels with proper density and thickness, approx. 80mm for hull and weather deck, reduced for superstructure. Aluminium foil film applied on the final layer of mineral wool in all areas. Acoustic insulation designed and applied to prevent transmission of structural and airborne noise. Acoustic insulation based on acoustic panels, mineral wool and other materials fitted to achieve noise requirements. Acoustic insulation applied to the surface of bulkheads and decks which separate noise sources from accommodation spaces and also between accommodation spaces when they are divided by a bulkhead or deck.12.2 ENGINE ROOMEngine room insulation carried out with particular care and, wherever possible, before the installation of any auxiliary equipment such as pumps, cabling, piping and other equipment. Lower edges of insulation properly sealed to prevent water ingress. Shell plating and frames, bulkheads and stiffeners insulated according to good practice as per insulation system manufacturer and Class requirements and covered with aluminium panels for better comfort and aesthetics.13. PAINT SYSTEM13.1 Hull above waterline: AWLGRIP Blue Steel Pearl13.2 Hull below waterline: INTERNATIONAL13.3 Main deck (surface under teak planks): INTERNATIONAL13.4 Superstructure: AWLGRIP Insignia White/Panther Black Pearl13.5 Fresh water tanks: INTERNATIONAL13.6 Sewage tanks: INTERNATIONAL13.7 Hull inside painted with INTERNATIONAL system14. SAFETYVessel is equipped with complete safety package, in accordance with MCA LY3 requirements. All equipment easy accessible. Four life rafts, make: ZODIAC SOLAS A-pack, installed in bulwark lockers on sun deck, two on each side. The yacht is equipped with the tender stowed on the bow and launched by dedicated hydraulic crane. While underway, the rescue tender shall be stowed on a dedicated cradle on the aft sundeck and launched by means of a davit.Optional Ultra Fog extinguishing system for accommodations available upon request. Medical kits, medicines, resuscitation equipment, etc. is considered to be Owner’s Supply.15. EQUIPMENT SPECIFICATIONHULL	Hull	Grade A steel construction, according to plans approved by the Class. Welding work X-rayed according to class requirements.Superstructure	Aluminium construction, according to plans approved by the class society. Welding work X-rayed according to class requirementBallast	Fixed ballast leadMAIN SYSTEMS	Main Engine2	CAT C18 ACERT B-rated @ 500kWGearbox	2	ZF W650 ratio 5.138:1Generator	2 CAT C4.4 99ekW, sound shieldsShaft line	2	RUBBER DESIGN, oil lubricatedPropeller	2	VAN VOORDEN 5-bladeSteering gear 1 JastramExhaust system: main engines 2TIO dry/wetExhaust system: generators 2	Halyard dry/wetStabilizers 2	CMC Stabilis Electra 120Thrusters 2	VERHAAR OMEGA 55kW ElectricWaste treatment system 1 HAMANN HL-Cont PLUS 02 SlimAir conditioning 1 WEBASTO 448k BTUMechanical ventilation 1	WEBASTOER ventilation 2	GIANNESCHIFuel separator 1 ALFA-LAVAL MIB 303Watermaker 2	SEA RECOVERY 1400-2Cathodic protection 1	Set of zinc anodesHydraulic system 1	FEEBE customPumps GIANNESCHIPaint system INTERNATIONAL/AWLGRIPDECK EQUIPMENT	Windlass	2MAXWELL VWC 8000Morning winch	2	MAXWELL VC 6000Chain 2 Stud link 17.5mm galvanizedAnchor	2 MANSON HHP stainless 300kgMooring equipment	CONRAD custom stainless steel bollards and fairleadsGantry crane	1	FEEBE electricDeck crane	1	BESENZONI G. 711Manual tender davit	1	FEM STRUTTUREGangway 1	FEEVE hydraulic 6.5m rotatingStern gate 1	FEEBE hydraulicFolding bulwarks/balconies 4	FEEBE hydraulicBalcony side door 4	CONRAD custom stainlessAft sliding door main deck 1	OPACMARE 2135Aft sliding door bridge deck 1	OPACMARE 2T11Superstructure side doors 4	NEWTHEXWatertight doors 2	NEWTEXDeck hatches RONDALWindows & windshield TILSEPilot seat 2	BESENZONI G. 711Windscreen wipers 5	EXALTOER grilles 2	CONRAD customTeam deck CONRAD customDeck jacuzzi 1	TEUCO Mirro 630, customizedSauna 1	CONRAD customRunning machine 1	TECHNOGYM Spazio FormaTraining wall 1	TECHNOGYM Kinesis HeritageLoose deck furniture Owner's DeliveryELECTRICS & ELECTRONICS	Entertainment electronics	Custom system based on media serverNavigation & communication	FURUNO/SIMRAD/IMTELLIAN230VAC main switchboard	CONRAD custom24V panels	CONRAD customSynoptic panels	CONRAD customService batteries	MASTERVOLT, 2V cellsGNDSS batteries	MASTERVOLTStart batteries	MASTERVOLTShore converter	1 ASEA AC90SV-3Interior lighting	FORESTI&SUARDI, MASIERO, PIETER ADAMExterior lighting	SAVAGE LIGHTINGDOMESTIC EQUIPMENT	Dumbwaiter	1	LIFE EMOTIONHousehold equipment	GAGGENAU/MIELESAFETY	ER fire extinguisher	1	NOVEC1230Life raft	4	ZODIAC SOLAS A-pack 10-personSafety equipment	According to MCA LY3 (Owner's delivery)Main tender	1	CASTOLDI JT16 (Owner's delivery)Crew tender	1	WILLIAMS Turbojet 385 (Owner's delivery)Owner’s deliveries and/or PC Sums shall include but not be limited to the following positions (if building the sister-ship):PC SUMS	Plumbing fixtures 50,000 EUR netInterior hardware 70,000 EUR netAudio-video/Entertainment 150,000 EUR netNavigation & communication 250,000 EUR netDomestic appliances 80,000 EUR netInterior lighting 80,000 EUR netBlinds & curtains 40,000 EUR netMarble & stone 100,000 EUR netFabrics, leather & carpets 50,000 EUR netInterior designer and decorator of Owner's choice Paid by OwnerEquipment specification is believed to be correct at the time of writing. The builder reserves the right, in agreement with the Client, to amend specifications, materials or equipment in case any of equipment is not offered any longer – in such case specified equipment will be replaced with equal equipment of the same or other brand.General arrangement plan of the yacht is an integral part of this specification. 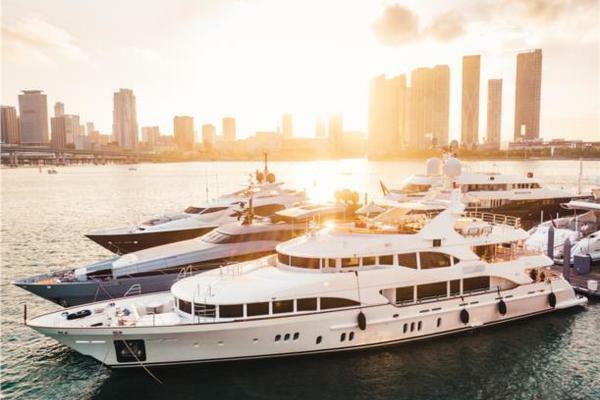 Conrad Shipyard is an experienced luxury yacht builder specializing in building highest quality, class approved, steel, and aluminum luxury yachts ranging from 20 to 100 meters in length. We are located in Gdansk, Poland, one of the most historic shipbuilding cities in Northern Europe. Our shipyard employs, in partnership with our parent company Marine Projects Ltd., over 400 of the best specialists in naval construction, complex engineering, old-world craftsmanship, and modern yacht building. We cooperate with the most reliable and professional companies and suppliers in Poland, Europe, and throughout the world based on our motto “highest quality yachts at the best value.”Our shipyard has all the necessary in-house facilities to meet the most demanding wishes of the most demanding clients. It includes an engineering team of over 25 professionals, an interior design team, and production facilities for luxury yacht furniture, which meets the highest global design and quality standards.Delivery of a completely outfitted CONRAD C133, sister-ship to VIATORIS, can be delivered in 22-24 months from the time contracts are finalized.Modified & improved upon general arrangements for 40-45m motor yachts with both traditional and plumb bows are also available upon request. Imitation might be the sincerest form of flattery, but to considerConrad Shipyard’s40 metreViatoristo be a mere facsimile of anything that has come before would be missing the point entirely. The story ofViatorisstretches back at least a decade and is a tale of an owner and builder evolving together – one happy to fly under the radar and the other with everything to prove.“He’s a modest guy – this [yacht] is not a toy,” says Conrad CEO and chairman Mikołaj Król ofViatoris’sowner. “This is a home on the water; something very private to be enjoyed with just family and friends.”Viatoris, Latin for “traveller”, will be used for family sojourns from her base in Croatia.It was in 2008, during the doldrums of the global financial crisis, when this owner and Król began talking about what would one day becomeViatoris. He owned a 20 metre Conrad 66 sloop-rigged sailing yacht and aPrincess58 motor yacht but was ready for a larger motor yacht. Conrad, based in Gdansk, Poland, was formed in 2003 by its parent company, the commercial shipbuilder Marine Projects Ltd, and in 2005 launched its first motor yacht project, theBill Dixon-designed27 metreEscape S. Later, it launched two semi-custom Conrad 66s, and it is a testament to the yard that both of these owners went on to order custom projects nearly twice the size. One ordered Conrad’s 2013 launch, the 35 metre motor sailerLunardesigned byFrank Neubelt, then withNewcruise, while the other createdViatoris.WhenLunarmade her public debut at the 2013Monaco Yacht Show, she was moored near a 40 metreHakvoortcalledApostrophe. IfViatorisseems similar to the Dutch yard’s creation, it’s no coincidence. Her exterior is byReymond Langton Design, with naval architecture byDiana Yacht Design– the same team that createdApostrophe.Viatoris’sowner liked the classic silhouette and long overhangs ofApostropheand thought it was a style that would work well in his plans for a 30 to 35 metre yacht. But owner and yard soon found this wouldn’t be as easy. “We tried to pack everything in, but if you want to have the second staircase for crew, for instance, there was no extra space,” says Król. “And the proportions of the boat weren’t elegant [at 35 metres].” The design slowly crept up to the 40 metre mark, which the owner was reticent about, having planned to go no bigger than 35 metres. But as Król tells it, the owner justified the extra length when he noticed that the waterline length would be only 35 metres. “‘It’s still not above my limit,’ he was able to tell himself,” says KrólThe design brief given to naval architects Diana Yacht Design and exterior designers Reymond Langton was for an elegant yet aggressive yacht, and there is certainly something edgy about the lines ofViatorisWhen it became time to create the new yacht, Król went straight to the source,contactingDiana Yacht DesignandReymond Langtonto ask them to take on the project. “I have to admit, I was wondering if Andrew [Langton] would say, ‘now that I build 80 metre boats, I’m not going back’,” says Król, who candidly recounts the story of another famous yacht designer who had been reluctant to work with Conrad, despite its history with well-known designers such as Dixon and Neubelt. “[The designer] had doubts as to whether Conrad could build his boat without his name being tarnished,” Król says, and so he was happily surprised when Langton said yes.“It’s always nice when people like your work, but at the same time you always want to push design on,” says Langton. “We’re a company that never does the same thing – even yachts built quite close together, likeLady LaraandAviva, look quite different. We’re always trying to move forward. We wanted to create a new design inspired byApostrophe’ssilhouette.Viatorishas quite a sporty, racy look by comparison – she reflects a more modern, up-to-date style.”Viatoris’sexterior is incredibly sculptural. “We tried to design in 3D – we have shapes that go from one to another that are continuous, and we cut forms into the superstructure,” Langton says. Reymond Langton has created undercuts and arcs that emphasise the length of the boat and also create visual tension. It’s a technique borrowed from another, much larger, design – 91 metreLady Lara. The chiselled effect creates a highlight on the upper surfaces while the undercuts give a nice play of shadows and pick up the reflection of the water.These sculpted good looks add an extra dimension to the engaging exterior lines, which are perhaps most pronounced amidships, where a line flowing down from the superstructure intersects with one rising up from the bulwarks, creating a signature “X” shape. It was even more visible on an all white paint job before the steel grey hull colour was chosen, which shifts from grey to blue shades in different light. This was just one of more than a dozen designs that Reymond Langton proposed to Conrad and the owner.“That’s the way we work – Jon [Bevan, Reymond Langton designer] and I will both start sketching profiles, sort of competing with each other,” Langton says with a laugh. “We play off each other and pick up details from each other, and we try to experiment with things. I think Jon won in the end. Mikołaj really liked the X shape, but the owner was worried it was going to be too much of a definitive feature.”The owner is so low-key that he was concerned about standing out too much, or being “that X boat”, but eventually he came round. Usually, Reymond Langton would visit a boat during a build to see how the design was being executed, but this was a slightly different arrangement and once the design was agreed and the 3D plans delivered, Langton and Bevan didn’t see the boat until her debut. Standing dockside staring up at the sculpted exterior, the designers were impressed by Conrad’s ability to bring their design to life so perfectly, and they credit this to the fact that Król himself is an architect. In addition to running the shipyard and managing the project, he also designed the interior ofViatoris.The brief was to create an elegant yet comfortable interior and extremely liveable exterior spaces. The owner was clear on exterior attributes he required, especially on the sundeck, which has a unique layout for a 40 metre yacht. He wanted a pool up high at the front so he could see where he’s going while in the water, and he wanted it flanked by big sunpads. There is a flush teak deck and an infinity effect, so it feels like a pool. More unusual was the owner’s request for a glass sauna on the sundeck, creating an interesting challenge for the naval architects at Diana Yacht Design. It added extra weight to an already top-heavy sundeck – with the pool and gym up here as well – and considerations for fire insulation. The floor of the sauna is raised to create space for this insulation, so there’s limited headroom, but it’s not especially needed as one will be seated or reclining when inside. But the views from this glass house will be immense, watching the world roll by as you sweat.From an architectural point of view, adding all this weight on the top deck meant having to compensate on the lower deck. “If you put heavy items, like batteries, near the bottom they work as a counterweight, then you can have these extra-heavy items up top,” says Hans-Maarten Bais, Diana Yacht Design’s creative director.The owner was clear on exterior attributes he required, especially on the sundeck, which has a unique layout for a 40 metre yachtThe brief also called for bulwarks and balconies opening in the saloon and master to let fresh air in, as the owner doesn’t care for air conditioning. But Conrad didn’t want to use the typical sliding doors, instead opting to create their own rugged doors of the same heavy-duty quality that might be seen on their ships. “This could be found on a boat even more than 500GT – they are solid,” Król says of the thick stainless steel and glass doors, which fold accordion-style to reveal the descending bulwarks. The floor-to-ceiling doors are mirrored on either side of the saloon, creating an open, breezy living area. Rather than pushing sofas up against walls or windows, a gathering of low love seats and armchairs, in a periwinkle blue, is set in the centre of the room, all facing inwards to create a cosy lounge.The owner is a fan of oval elements so oval cabinets and ceiling trays can be seen throughout, such as the main deck aft foyer, with the oblong credenza. This entryway is narrower than the saloon, as stairs to the upper deck or ventilation are hidden on either side, masked by curved joinery and backlit onyx inside the foyer.Król selected all the stone seen on board, and the mix of black and white marble finds harmony in the orange-copper veins that run through each. “I purposely didn’t choose perfect stone or try to mirror it,” he says. “Stone is stone, it needs to look natural.” Myriad wood choices are tied together through staining. The saloon has rosewood and stained oak, the latter of which is carried through the corridors, while the floors are natural oak.The foyer to the master has a small office that looks out of a wide window – just enough space for the owner to work solo. The wow factor in this nice-sized master suite comes in the balconies, which have an ingenious design created by Król himself. The glass doors fold open, which then act as a rail and a windbreak, while the balcony folds down and a loose railing is added in front for safety. The owner can do it all without the help of crew. There are two balconies on either side, creating an amazing cross breeze and two big chairs on either side can swivel out and look over the water.The owner is a fan of oval elements which have been incorporated throughout the interiorBut it’s not all about big features. The doorknobs, for instance, were specially made by Turnstyle Designs – Król splashed out £100 per knob, saying those with plastic latches on the inside, seen even on yachts from the top shipyards, didn’t meet his standards. He designed his own style of knob that Turnstyle created, a blend of click-lock and turning, so the doors and drawers are especially secure. Lamps in the master, inspired by tree branches and painted silver, were created by a Dutch artist, while the door handles throughout the accommodation are hammered chrome, which give a subtly reflective look. Leather headboards are by Marine Leather. A crystal light fixture created by Masiero hangs over the bed in the master – a partner to three others found on board in the saloon, dining room and a grand hanging fixture at the staircase.The guest rooms are interlinking in pairs and can be had in multiple layout options depending on the room, such as a lounge, double bed or twins. It’s a great solution so that when the owner cruises with two other couples, as is often the case, each can have their own VIP suite with a bedroom connecting to a lounge area. It would certainly make a fantastic charter yacht asset, too, thoughViatorisis planned to be private.The upper lounge is the epitome of leisurely living, designed to be a cinema with comfortable reclining sofas and darkened at the touch of a button. A dumb waiter, cleverly hidden behind the joinery, brings food up from the galley for movie snacks or dinner on the upper aft deck, with an expanding table. The owner wanted to create zones on this deck, so it has the feel of a much larger yacht with the dining area, a boomerang-shaped bar to port and a seating area to starboard. Ahead of the bridge is a vast foredeck lounge with a seating area and sunpads, another request from the owner.This is Diana Yacht Design’s 67th yacht, and the company considers each to be an evolution, using concrete data collected from each design to inform the next. 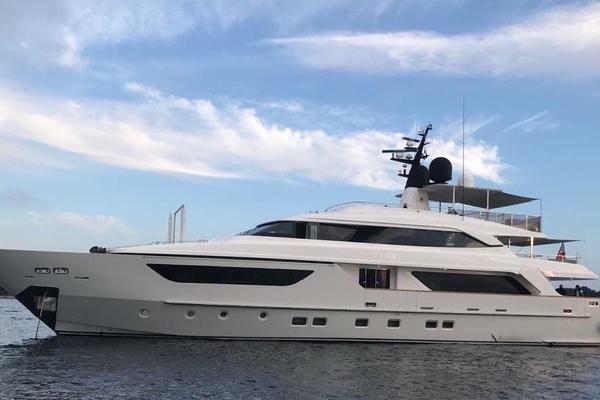 “This boat is also equipped with a bulbous bow to make her more efficient, and we just saw during sea trials that she was only using 65lph at 10.5 knots, which is really efficient,” says Bais. “And her captain says she manoeuvres ‘very nicely, turns like a car’.”Viatorisis quiet under way, even when down below. “The clearance between the props and the hull is very important,” says Bais. “You can put in all the insulation you want, but if the foundation of the engine and propeller and layout isn’t correct, you’ll never get a quiet boat.”It’s further evidence of the lengths Conrad has gone to on this new 40 metre. “The Polish mentality is to show we can do it,” Król says. The Polish locality, meanwhile, means that you’re getting a northern European build without northern European prices.And that’s for a superyacht coming from some of the best designers in the business.